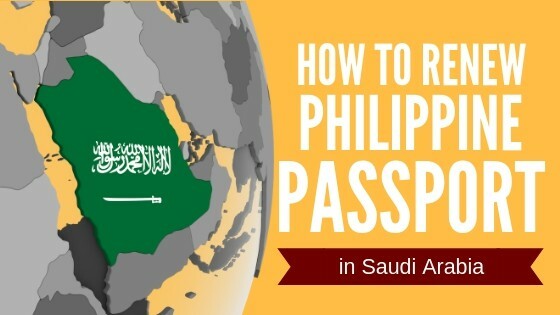 Where to renew a Philippine passport in Saudi Arabia. 1. Philippine Embassy in Riyadh. 2. Philippine Consulate in Jeddah. How to Renew a Philippine Passport in Saudi Arabia: 6 Steps. 1. Get an online appointment. 2. Go to the Philippine Embassy/Consulate or consular outreach site. 3. Proceed to the encoding area. 4. Pay the Philippine passport renewal fee. 5. Check if your Philippine passport is available for pickup. 6. Claim your new Philippine passport. 1. Don’t schedule more than one appointment. 2. Avoid dealing with agencies and people offering passport appointment assistance for a fee. 1. Can I apply for passport renewal without an appointment? 2. Can I apply for an extension of my expiring/expired passport’s validity? A printed copy of confirmed passport renewal appointment (only for applicants in Riyadh). Photocopy of the passport data page. Riyadh: Available at the Information Desk at the Embassy lobby and Window 3 of the Consular Section (or download here). Jeddah: Available at Window 4 of the Consular Section (or download here). Office hours: Sundays to Thursdays, 8 a.m. to 5 p.m. 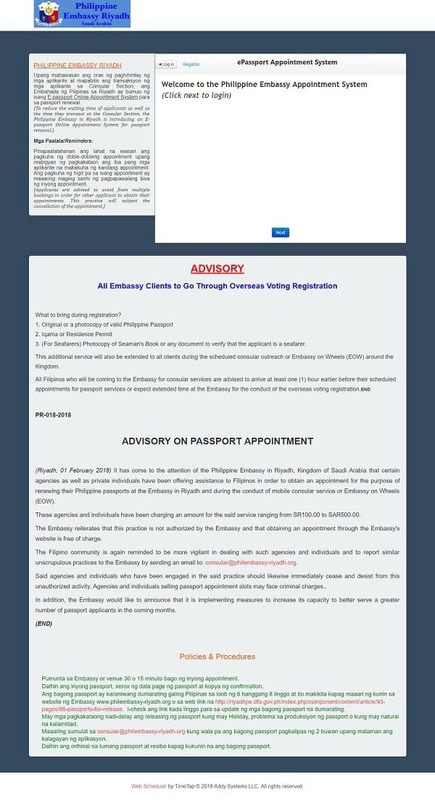 The Philippine Embassy and Consulate hold consular services, including passport renewals, in different cities in Saudi Arabia. Availing of this service near your location is much more convenient than submitting your application to the Embassy or Consulate. If you’ll go to an outreach conducted by the Embassy in Riyadh, you’ll need to set an appointment online first. For schedules and updates on consular outreach missions, check the Embassy or Consulate website and their respective Facebook page: Philippine Embassy in Saudi Arabia / Philippine Consulate General in Jeddah. Note: This step applies only to passport renewals in the Philippine Embassy in Riyadh. No appointment is required for renewals in the Philippine Consulate in Jeddah. Skip this step if you’ll renew in Jeddah. Use the ePassport Appointment System to get a slot in advance. First-timers will need to register for an account by entering their email address. After creating your account, log in using your registered email address and password. Then make an online appointment for passport renewal. Once you’ve booked an appointment, check your email for a confirmation notice from the Embassy. Read the instructions on passport renewal that come with the message. If you’re applying at the Embassy in Riyadh, arrive at the venue 15 to 30 minutes before your scheduled appointment. Bring your iqama because it’s needed for the guest ID. Submit the passport renewal requirements, except for your old passport that you’ll present later when you claim your new passport. Have your photo and biometrics captured. The information on your application form will also be encoded to a computer. You’ll be issued a collection slip. Bring the collection slip to the cashier and pay the Philippine passport renewal fee of SAR 240. New passports are ready for release after six to eight weeks. Check the Philippine Embassy or Consulate website every week for updates on passports that are available for pickup. If two months had passed and your new passport is still unavailable, you may email the Embassy or Consulate to follow up on your application status. Bring your official receipt and old passport when claiming your new Philippine passport. You may send someone to pick up your passport if you can’t claim it yourself. Your authorized representative must present his or her valid ID (both original and photocopy) plus your official receipt and old passport. The Embassy allows only one appointment per applicant and cancels any double or multiple bookings made by one applicant on its system. If you can’t make it to your scheduled appointment, cancel your appointment first before booking a new appointment. Beware of fixers at the Embassy in Riyadh and mobile consular service sites who charge SAR 100 to SAR 500 in exchange of a passport renewal appointment slot. Filipinos don’t have to pay a fee to secure an online appointment. Avoid and report any fixer to the Embassy via email. Yes, but only if you’re applying at the Consulate in Jeddah. Pregnant women (with a medical certificate proving pregnancy). Senior citizens aged 60 and above. Children aged seven and below. Yes, you can do so if you have a valid and urgent reason, and your passport is valid for less than six months or is already expired. OFWs returning to overseas employers with valid employment contracts processed by the POEA. Medical emergencies that require the OFW and family members to travel immediately to the Philippines or any country for medical treatment. 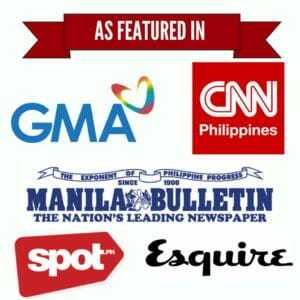 Death in the OFW’s family. OFWs returning home on final exit visas. Present your original passport and a photocopy of its data page, as well as relevant proof of travel urgency such as a medical certificate, death certificate, valid employment contract, subpoena, etc. You should also submit an accomplished passport validity extension request form. (Download here for application in Riyadh or Jeddah). In addition to the above requirements, the Embassy in Riyadh also requires plane tickets with confirmed flight details. Meanwhile, the Consulate in Jeddah requires an affidavit explaining the reason for the need for an extension and a consular service fee of SAR 80 (in addition to the passport renewal fee).